Without getting entangled in complex theories about the interactions between man and machine, today we’re looking at how you can make your e-store accessible to as many customers as possible. Your goal should be to encourage visitor trust in your store to the point of making a sale. Every time the user encounters a problem on the site, he or she loses a little more confidence. If it drops below a certain level, frustration sets in and the user leaves the website. That's why it's important to have sound ergonomics for your online business. Don’t forget that your goal (in addition to selling, obviously) is to show visitors that behind the e-store interface are competent and trustworthy individuals. This is the most imporant page on your e-store because this is where it all happens. This is where the visitor gets a first impression of your site and decides whether to trust you to the point of entering a bank card number to make a purchase. You should aim to have a general style that sets you apart, making you easy to recognize, and to have your product catalogue visible right from the home page. The site’s header is where you position the most representative elements : logo, name, unique background image, etc. It should be at least 250 pixels high, so that visitors can at least get a first look at your catalogue without having to scroll down. In other terms, the user should never have to scroll anywhere to see your number one products. 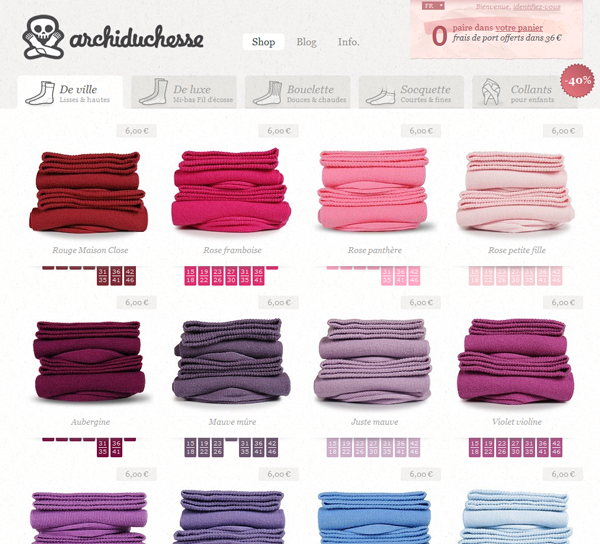 The homepage of the archiduchesse: products are immediately visible.. The visual aspects are really important, which is why you need to take time to think about visual identity before getting online. Find an elegant way of highlighting your products without overloading the page. As well, be consistent with your graphic design and colour scheme from page to page. For example, if you use a particular effect on the buttons of one page, use the same effect on all the pages of the site. The site’s search engine should be easy to find. As a visitor, we often know exactly what we’re looking for, so it’s important that we can find the search tool at a glance. When you’re building your site, think too about the way visitors navigate through categories : it should be simple and intuitive. In order to encourage visitor confidence, highlight your partners (banks and payment systems, transportation companies, etc.) and any online trust/reliability/security seals you possess. If you have a telephone number or an online chat function, don’t hesitate to highlight it. This will show clients that you’re available to them, and that will make all the difference. Of course, don’t use your personal number. They want to know they can contact support services, not that they’re interrupting the boss’s diner. Finally, clearly post information regarding delivery, returns, and general terms & conditions. Make sure you pay close attention to the details – the home page is absolutely crucial to your success ! Getting good natural search results: top Google rankings in 3 easy steps!